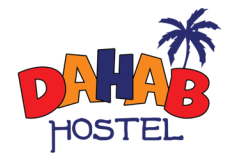 Dahab hostel is centrally located in the heart of Downtown Cairo. It is just a 3-minute-walking distance to the Egyptian Museum, and within easy reach to the main train and bus stations by public transportation, taxi or Metro. Building No. 26 – Rooftop 7th floor – Across from Thomas Cook. Taxi transportation in Cairo is affordable and safe. Most taxis will know how to get to Dahab hostel, when you give them the address. White colored taxis are with a meter but remember to carry the right amount of change if possible. Metro transportation is a fast and cheap method, as well. There are 2 working lines and a 3rd under construction, click here to download a Cairo Metro map. You will find our representative waiting for you holding a sign of your name and Dahab hostel, after you finish passport checking and custom clearance. Any cancellations should be notified at least 1 day before your arrival, otherwise you could be charged the full amount.